For this fruit banana split recipe we used cantaloupes and raspberries for the scoops and toppings. You can use watermelon and blueberries as shown in the picture or your favorite fruits. Just make sure one of the fruits can become a scoop, like melons, to really simulate a banana split. 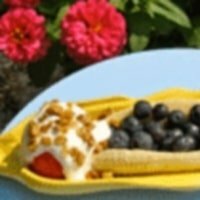 This non traditional banana split is packed full of healthy fruits, non fat yogurt and granola. It's perfect for breakfast, a healthy snack or delicious dessert. Below you will find a list of ingredients, directions, recipe nutrition information and the Weight Watchers points including the SmartPoints values. The beauty of this recipe is you can have it for breakfast, a side or snack or even dessert. 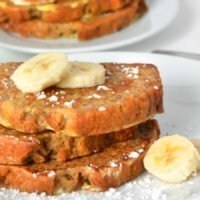 This recipe makes for a quick, easy and healthy breakfast. Who says you can't have dessert for breakfast. Peel bananas and cut in half cross wise; cut each piece in half lengthwise. Place cantaloupe "scoops" at each end of dish. Fill center space with raspberries. Add vanilla extract to yogurt and stir until smooth; spoon over cantaloupe "scoops". You can use your favorite fruits to make your own fruit banana split recipe for a great, healthy snack anytime of the day. Add some toppings like sesame seeds, nuts or even syrups. Just be sure to adjust the nutrition and points accordingly. 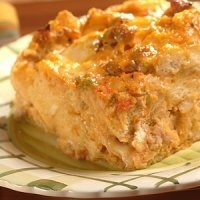 For something that's not so sweet as this breakfast recipe try this breakfast casserole instead. 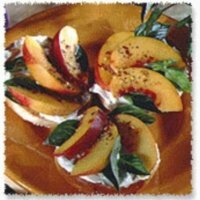 Add some juicy fruit taste to your typical breakfast bagel with this yummy recipe that's topped with cream cheese, basil and nectarines. This recipe was modified from the original source making it more WW FreeStyle friendly with fewer SmartPoints. This recipe puts a yummy twist on a classic that will have you saying Umm Umm Good! 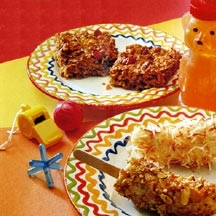 Here's another fun, easy and tasty recipe to get in your bananas for the day. 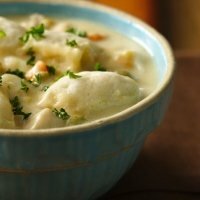 Chicken and Dumplings is the perfect comfort food for dinner tonight so check out this recipe. 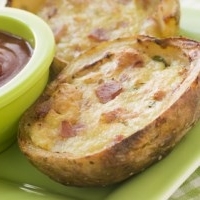 This stuffed potato has it all that you can have it as the main course or pair it with a salad or soup. Read all about this diet to see if it's right for you. With 7 modules (or phases) and changes in the foods you eat every 4 days, this is one diet you won't get bored with. Check out all these appetizer recipes and try something new for your daily snack, before dinner appetizer or even as a side dish. Download this free spreadsheet to track your calories, weight loss and more. Complete with graphs so you can see your progress.